David Liebler, a long time Hoboken politico and anti-Zimmer stalwart made good on a public threat his ejection from a City Council meeting last month would "not stand' filing a lawsuit in federal court. Citing political speech and civil rights, the undated lawsuit targets Mayor Zimmer in her official and individual capacity naming in addition, the City Council, City of Hoboken and its Corporation Counsel as defendants seeking unspecified compensatory damages. remarks in public portion were ruled out of order last month. He's filed a lawsuit against Hoboken and the mayor in federal court. Last month at the final council meeting before the critical November ward elections, Liebler nearly completed his five minutes in public portion before attempting to launch allegations against the mayor's husband, Stan Grossbard and butting heads with the City Council President Ravi Bhalla. The dispute erupted when Liebler declared the mayor's husband was "the unofficial mayor of Hoboken." He pointed to emails recently leaked in yet another litigation against the City to several medial outlets thought released by failed City Council candidate and former Hoboken Housing Authority Executive Director Carmelo Garcia. Those emails showed opinions offered by the mayor's husband to several HHA commissioners who did not act on his public policy suggestions back in March of 2013. A statement issued by Liebler's attorney, Charles Gormally of law firm Brach Eichler says Hoboken's Mayor Dawn Zimmer and City Council have been sued for "depriving (Liebler) of his First Amendment rights to express himself and having him physically removed" from the October 21st City Council meeting. Mayor Zimmer was not in attendance at the October 21st City Council meeting but the suit states its belief based on unspecified information of her "conspiring with council members" to prevent comment on her husband's role "in Hoboken government." A long time antagonist of Mayor Zimmer and Reform, Liebler has been affiliated with and supported numerous Old Guard candidates. Most recently, Liebler voiced a pro-development stance as a guest speaker at a pre-election Liberty Board of Realtors and MSTA sponsored event; strongly backed the 2013 Ruben Ramos for Mayor campaign and has performed unspecified political activities for lame duck Councilwoman Beth Mason. In 2009, he applied and failed to gain a position working for Mayor Zimmer in her administration's communications department. Bhalla declined comment surrounding pending litigation he had not seen. Grafix Avenger noted in a breaking report last night the litigation had not been served upon the City of Hoboken as highlighted on PolitickerNJ. Liebler who has in the past complained about the annual million dollar cost of litigation to the City of Hoboken, now sees himself a plaintiff driving up those same legal costs to Mile Square taxpayers. paid for by Councilwoman Beth Mason back during the Hoboken 2013 mayoral race. In addition, he's known to have performed political work for Beth Mason. In the recent past, David Liebler has been less than enamored with the First Amendment political speech of other Hoboken residents he politically differs. In 2012, he publicly come out in support of Lane Bajardi and Kimberly Cardinal Bajardi's frivolous SLAPP-suit seeking $2,000,000 each from Grafix Avenger, MSV and a dozen local online commenters. 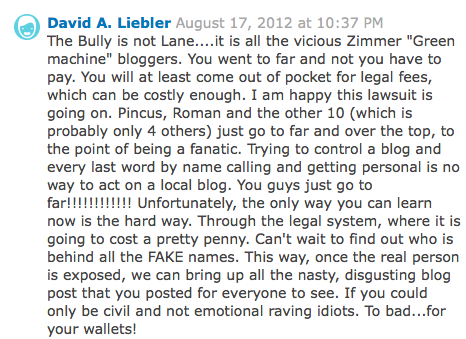 In Hoboken Patch's August 2012 story, Liebler savaged what he called the "vicious Zimmer, Green machine bloggers" saying they "went to far" and announced he was "happy this lawsuit is going on," He concluded his Patch comment mocking the defendants writing, "To bad...for your wallets!" On Hoboken Patch in 2012, David Liebler celebrated the notorious SLAPP-suit directing remarks against the named defendants: Grafix Avenger and MSV and a dozen Hoboken residents screen names. The suit was thrown out of court and Lane Bajardi, Kim Cardinal Bajardi and their attorneys hit with $280,000 in legal fee sanctions. Liebler commissioned a series of anti-Zimmer cartoons published on the scummy pro-Mason website, Hoboken411 in 2013. The Bajardi v Pincus discovery emails showed Lane Bajardi ghostwriting the notorious political content and in numerous screen names below attacking Hoboken residents, municipal workers and elected officials over years in seeking to advance Beth Mason's political career. Like most backers of the Old Guard political class in Hoboken, Liebler is not known to have ever offered any public criticism for the smear jobs and venomous attacks frequently appearing in the posts and comments on the heavily censored website leading into the Bajardi SLAPP-suit before or since. In 2015, Liebler submitted and saw published a guest piece on MSV and a recent letter to the Jersey Journal on Vote-by-Mail fraud. In previous public comments, he's hinted at culpability of Mayor Zimmer who has publicly voiced opposition to electoral fraud using VBM ballots. He's not publicly commented on the sizable several hundred fourth ward VBM haul by Councilman-elect Ruben Ramos in last month's election. Talking Ed Note: David Liebler made good on his threat but what compensation if any is due someone interrupted near the conclusion of their five minutes in public portion at a Hoboken City Council meeting? 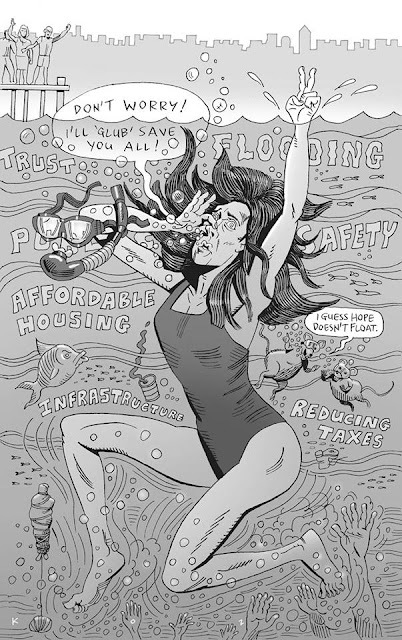 In 2012, Liebler rejoiced at the Beth Mason supported frivolous SLAPP-suit by Lane Bajardi and Kim Cardinal Bajardi against a dozen Hoboken residents for their political speech. Hundreds of thousands of dollars in legal efforts were expended in an attempt to destroy their lives. Now Liebler wishes to be compensated for his First Amendment rights to political speech where he wasn't permitted to complete five minutes of public comment uninterrupted. 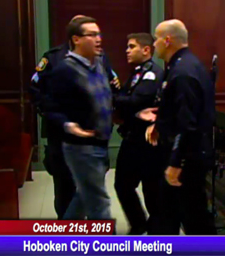 He's previously complained about the legal costs to the City of Hoboken in earlier council meetings. While MSV recently wrote it's likely the mayor's husband is a limited public figure (even if unwillingly) for being cast into the role of defendant in the Carmelo Garcia "ethnic cleansing" lawsuit, the City Council rules offer some leeway and discretion for the Council President on public speakers' behavior. By MSV's calculation, David Liebler is owed at least five seconds of additional time in any future public portion of a Hoboken City Council meeting and 30 seconds might be ideal compensation considering this circumstance. In the future, it's better for the council to allow borderline slander rather than become a direct party to more civil litigation. Leave it to the person attacked to decide if they wish to pursue any action for reckless disregard of the truth versus the burden on taxpayers to fight and pick up the tab. As for David Liebler, he's been the most genial and humorous of Old Guard soldiers in all his communications with MSV spanning more than five years. Sadly, he came out with some unfortunate remarks on the First Amendment rights of others (including this editor) and now seeks a payout from Hoboken taxpayers for what some will see as spurious damages. In that perspective, this litigation may prove more costly to the plaintiff than he anticipates. Motion to dismiss. Related: Grafix Avenger posted some choice comments and tidbits from David Liebler who sounds much like the screen name Lane Bajardi admitted to using on NJ.com. In one public post, Liebler wrote of his disdain for the mayor and her husband who he called "blood diamond boy." The Hudson County View earlier this year reported the story of Lane Bajardi's admitted screen name allegedly making anti-Semitic statements about the mayor's family and "blood diamond money." Liebler also bragged about a list of online local screen names targeted for public humiliation.